Undoubtedly, Facebook is the number 1 social-media platform at this moment. We are saying this not only because of their popularity, but due to their user friendly environment and a bundle of functionality to Facebook users. In this modern world, Facebook is the easiest way to connect with the family, friends and relatives. For people involved in business, it’s a great place for them to interact and connect with new customers. Everybody on this planet, need some fame and Facebook is providing that FAME by providing a free unique identity to them. Here You can connect with anybody by just sending a Friend Requests for approval. 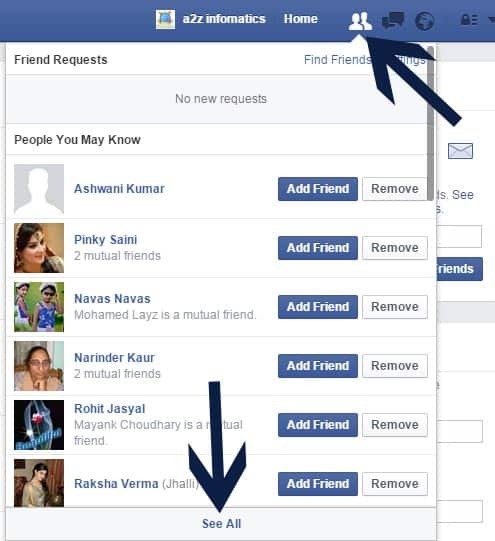 Facebook is also helping many companies / businesses to catch their unreachable customers. Simply, they are doing a great job. At Facebook, there are only two options by which we can connect to others. By simply following that person OR Becoming friends (by sending a friend request). If we take the first option, Just following a person doesn’t satisfy your needs in general. By following a person you can only view his / her updates, what about your your posts / updates. The person you are following will never get your stuff on his / her wall. Does this means true connectivity ?. No, for true connectivity the person has to accept your friends request. By just following a person, you are throwing your reputation to the person who actually not interested to be friends with you. So, from now onwards start unfollowing peoples who haven’t accepted your friends request. Sorry for the harsh words 🙁 . To unfollow, just go to their profile page and un-tick the “follow button” 🙂 . Let’s move to the other left option, Becoming Friends (by sending a friend request). While using this option, you always have to understand that some will accept it and some will not. Don’t panic, it’s a part of this game. We believe, a normal person will be more than happy by having 200-250 Facebook friends (real one’s). But in real, to get better stardom, fame and exposure (Likes, Shares and Comments), the person have to go for much more friends or we can say, as much as possible. There is a limitation too for these numbers, Currently, Facebook has limited their users to add 5000 friends only, don’t you think that’s a quite huge value. Now, you maybe wondering, If sending these friends request to not known individuals can help you in the cause?. The answer is YES. In addition, there is a BIG RISK too while performing this act. Facebook people now a days are very strict against these type of activities. There are strong chances that you will be restricted by Facebook. Here, we just want to suggest to do it gently (1-2 friends request in a day) and do it using your brains 🙂 (sending request to friends of your friends, this has some low risk). Always remember, the so called RISK is everywhere and we have to take it someday 🙂 . 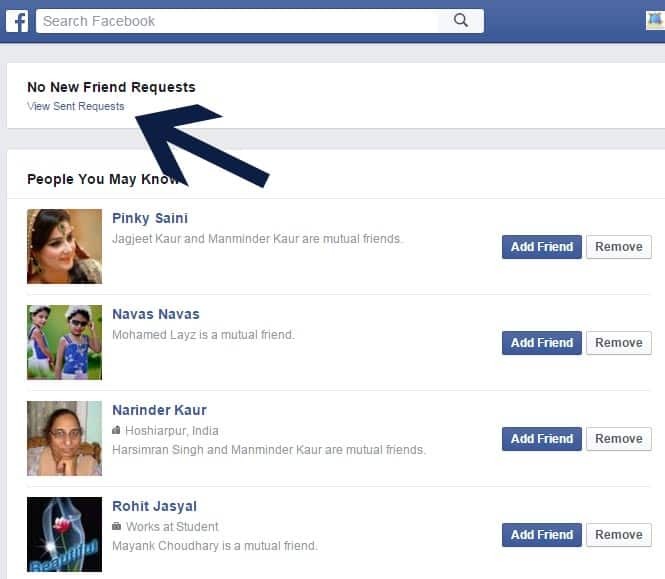 Don’t forget to delete the unaccepted friends request for better going. 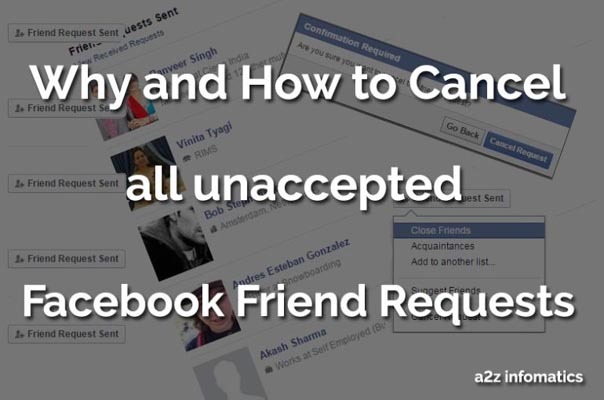 Here goes the full how-to / tutorial about finding and deleting all unaccepted Facebook friend requests. 1)- Easiest of all 🙂 , Just login to your Facebook account and move over to your Home page. 2)- Now go to Top Navigation Menu, just click on “Friend Requests” Icon and you will see something like this (shown in the figure below). 3)- Now from this drop down menu / list, Click “see all” at the bottom (shown in the above figure itself). 5)- After clicking “View Sent Requests”, You will be at your destination. Here, you will find the complete list of peoples who haven’t responded to your friends request in the past 🙁 . 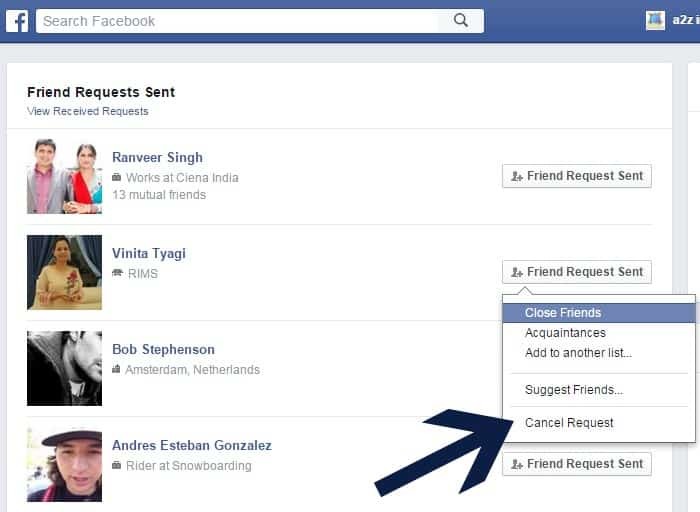 Just hover to the “Friend Request Sent” button opposite to any name and you will find the option to cancel that request or we can say mistake (Demonstration shown in the figure below). 6)- Now what, dear click cancel request button 🙂 . A confirmation popup window (shown in the figure below) will appear, supply “Cancel request” to it and it will be deleted permanently. Repeat all the necessary steps on each and every person who haven’t responded to your friends request. Throw them out of your Facebook Profile, SORRY for being harsh again 🙁 . Why to perform this act of deleting all “Sent Requests” IMMEDIATELY ? You maybe reading this post mistakenly, and is wondering about why we require to remove all sent requests in the past. Don’t worry, we have some strong clarifications to remove your confusions. A)- Don’t you think, Your Reputation is in danger here. The majority of the people at Facebook offers following option on their profile. Actually, they knows the fact that either they accept any friend request or not, This sender of the request will always be a follower to their Facebook profile. Sorry to tell, but in real you are harming your esteem for no justification. Following someone who isn’t interested or serious to accept you as a friend on his / her profile doesn’t make any sense. Always remember, this algorithm doesn’t apply if the next person is any celebrity 🙂 . B)- You May get some Restriction or get Blocked on this Social Giant Place. Facebook algorithm to control this act is getting harder and harder. Technically, throwing friend requests to not known individuals is a sure element of spam and is surely against Facebook Terms and conditions. So do you think, this big social giant will allow you to enjoy this. The answer is a big NOOOO, Never. This is the only reason why we are requesting you to perform this act with your profile as earliest as possible, before any penalization by Facebook. That’s all for now. We don’t think anything related to this has been missed out. Still, If you think something is missing. You can request us to update the same as we (a2z infomatics) always try to provide complete, “near to accurate” info to our valued readers. Thanks for giving your precious time, God Bless Everybody.